In a north German village full of righteous adults and gravely beautiful children, strange things are happening. A wire stretched low between gate posts trips a horse and injures its rider, the local doctor. On a baron's estate, the wife of a tenant farmer falls to her death through weak floorboards in a mill. In retribution, the baron's cabbage crop is destroyed and his son Sigi is found hanging upside down in the mill, his buttocks streaked with whip marks. Karli, the retarded son of the doctor's midwife, is assaulted in the woods and left to die. On the desk of the local pastor someone leaves a dead bird, scissors rammed through its small body. The Munich-born, Austria-raised Haneke, 67, has been called the supreme sadist of European art cinema. His 1997 Funny Games, which detailed the psychological and physical torture of a family by two interlopers in tennis whites, was an insolent, almost pedagogical exercise in audience abuse. The Piano Teacher (2001), in which Isabelle Huppert is involved in various forms of sadomasochism with her mother, her young beau and herself, took the Grand Jury Prize (second place) at Cannes. Four years later Caché, the study of a family victimized by a mysterious provocateur, won Cannes' Best Director award on its way to becoming an international hit. In an era when mainstream movies cozy up to their audiences, begging for acceptance, any director who challenges the viewer by boldly undercutting expectations may well be charged with mental cruelty. There's no doubt that Haneke's films are grim, and that they goad spectators to confront distasteful truths. But they are so expertly made that they carry their own cinematic wonder. And, given the state of the earth at this moment, we may ask which sort of filmmaker is more in touch with reality  the cheerleaders who confect standard comedies and action films, or the ones like Haneke who insist you look head-on at the face of intolerance. It could look a lot like your parent's face, or your own. 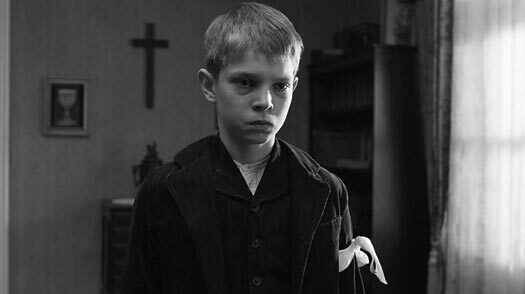 Haneke is not a perpetrator of cruelty but a prosecutor of it; and The White Ribbon, constructed step by meticulous step, scene by forbidding, foreboding scene, is his grandest indictment of intolerance. He tells a story of an entire society through five important men in the village  the Baron (Ulrich Tukur) who owns half the land in the area, his steward (Josef Bierbichler), a tenant farmer (Branko Samarovski), the doctor (Rainer Bock) and the pastor (Burghart Kluassner)  and their families. The one outsider is the village schoolteacher (Christian Friedel). All will be tainted by tragedy; many are responsible for provoking it. They may be evil, or they may be the enablers of evil: the weak ones who see signs of malignancy and do nothing. "Father Told Me Not To"
The film takes its title from the ribbons the pastor forces his children to wear when he thinks they have disobeyed him. "The white color," he says, "was to remind you of innocence and purity." But this strict lesson, meant to inculcate the fear of God, doesn't always take root. In one early scene, the teacher sees Martin (Leonard Proxauf), the pastor's elder son, walking on the narrow rail of a wooden bridge above a stream. The teacher asks why he is risking his life, and the boy replies, "I gave God a chance to kill me." Martin is an ordinarily rebellious kid, and this is quickly noticed by his father, an acute observer, or imaginer, of sin. In an inquisition cloaked in euphemism and oozing threats of early death and eternal damnation, the pastor exacts from Martin the confession that yes, he has been masturbating. His punishment: to sleep with his hands bound to the sides of his bed. When a fire breaks out nearby one night, Martin implores his younger brother to untie him. "I can't," the boy replies. "Father told me not to." A generation later, this would be the good Germans' answer to why they allowed or participated in the atrocities of the Third Reich. (It was the defense of the Kate Winslet character in The Reader.) They were only following the orders of their father, the Fuhrer.